HEALING SPA JOURNEYS ON A STRETCH OF PRISTINE SHORELINE. Spa experiences designed for your supreme wellbeing in Koh Samui. Retreat to a calming haven inspired by the diverse local culture. 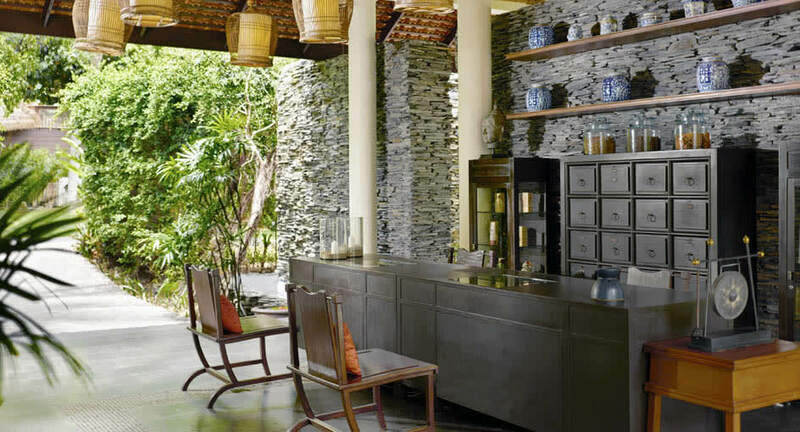 Tropical greenery and relaxing décor entice you to leave everyday stresses behind. Revel in the healing powers of island ingredients. Let your whole being blossom under the expert touch of our therapists at this Koh Samui spa resort. Feel your energy restored by purpose-designed movements performed with our signature blend of oils. Succumb to deep relaxation as the therapist stimulates your circulation and works on your meridian lines for overall wellbeing. This signature treatment honours the coconut, once the principal livelihood of the island. Feel hydrated through a series of treatments that harness the fruit’s health benefits. Your journey begins with a hydrating Coconut and Mint Scrub that renews and softens the skin. Your muscles are eased into relaxation with a Coconut Poultice, before a Facial Drainage therapy to reveal your natural glow. The spa is just incredible and is right up there with the best we have ever visited in the world. Booked a massage at the spa, which made us feel in heaven.